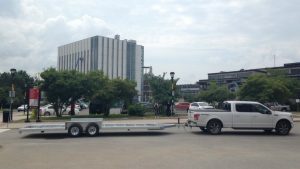 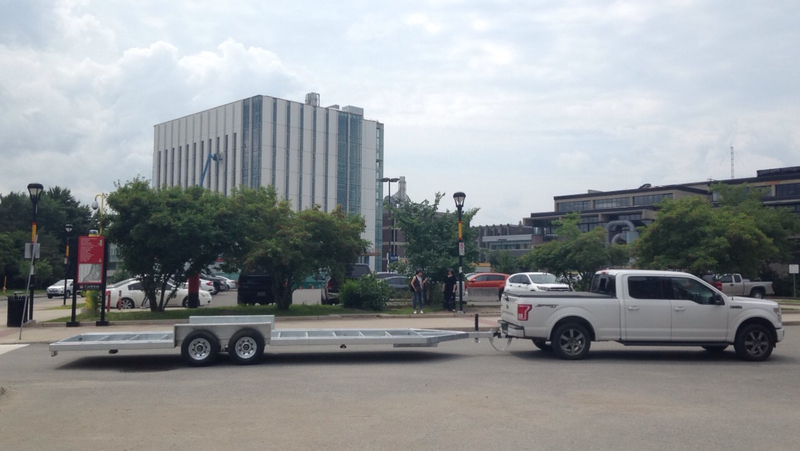 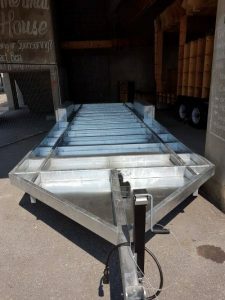 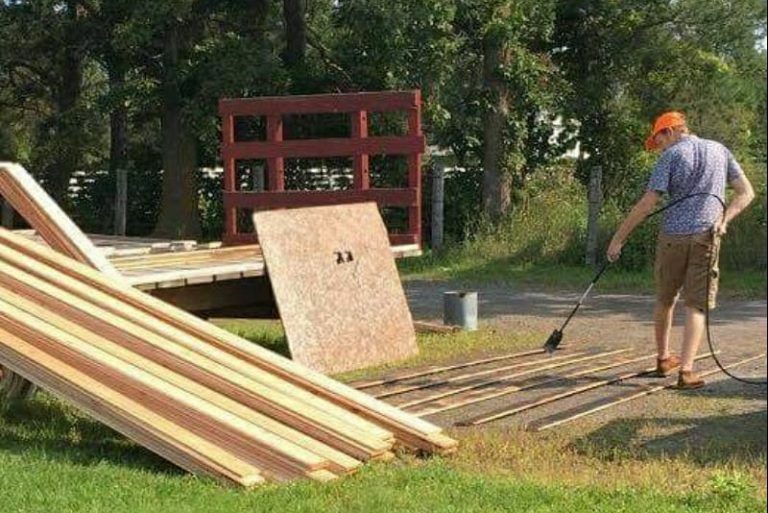 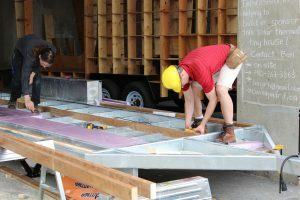 The arrival of the trailer bed, purchased from Lumbec Inc. in Gatineau, marked the beginning of the construction process. 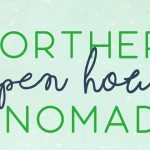 Seeing the trailer in person had the whole team feeling excited as all of our planning and research was soon going to become a very tangible reality. 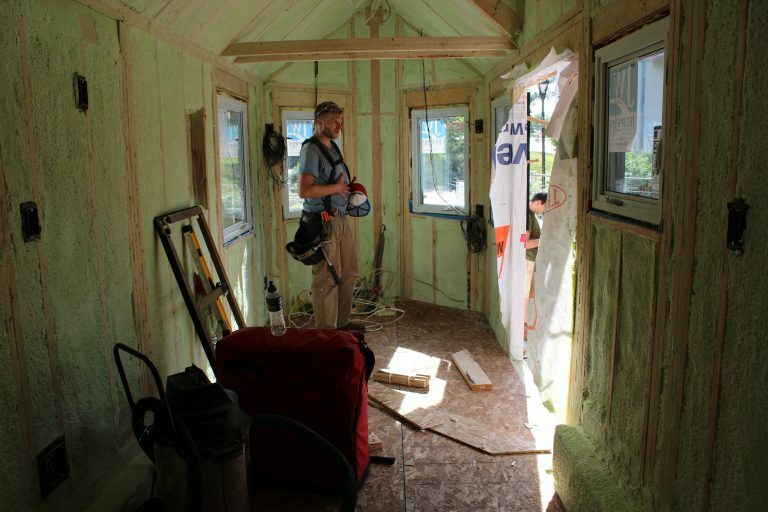 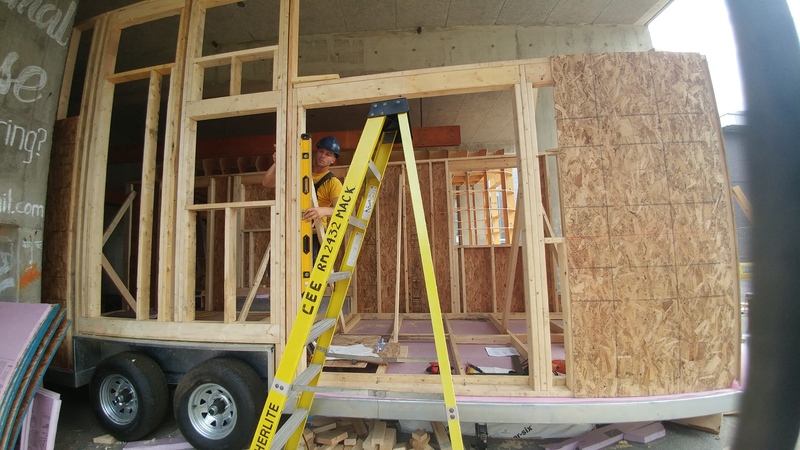 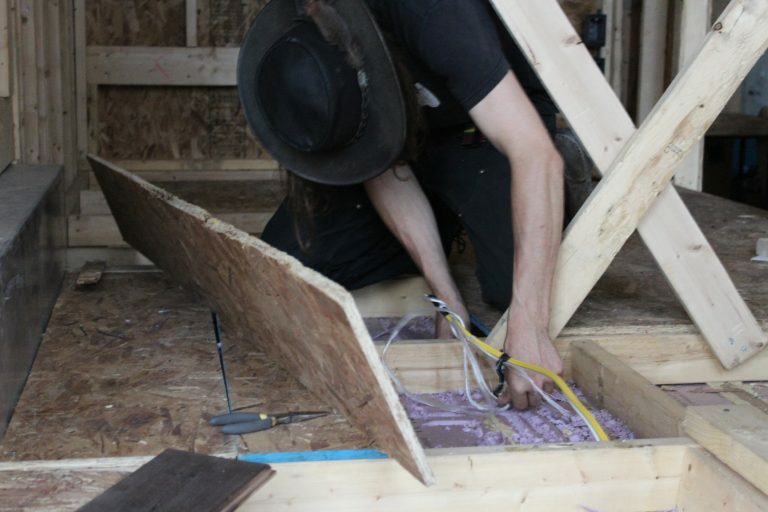 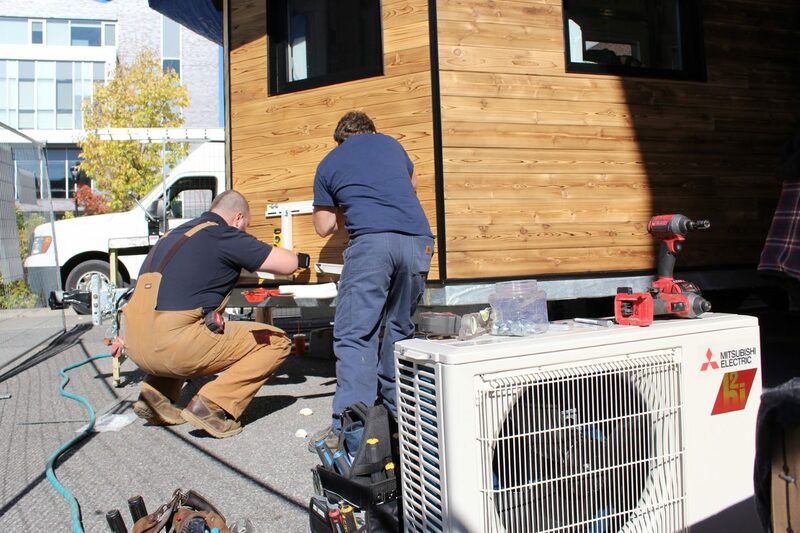 The trailer bed had to be insulated before any framing could be started. 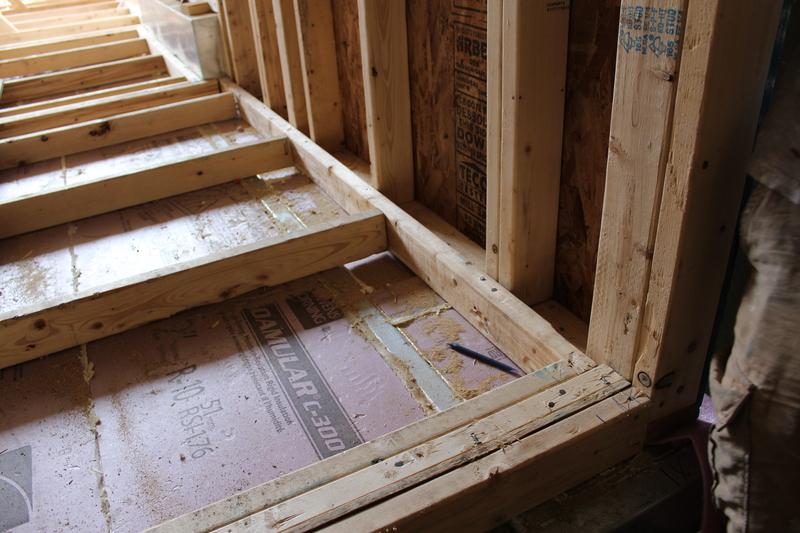 Rigid insulation was used to prevent the steel of the bed from conducting and affecting the interior temperature controls. 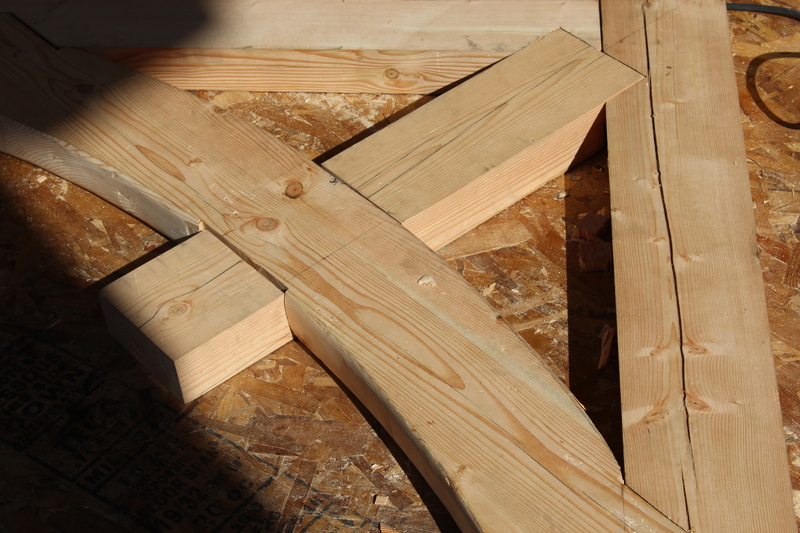 The bed was structurally reinforced by adding wooden joists. 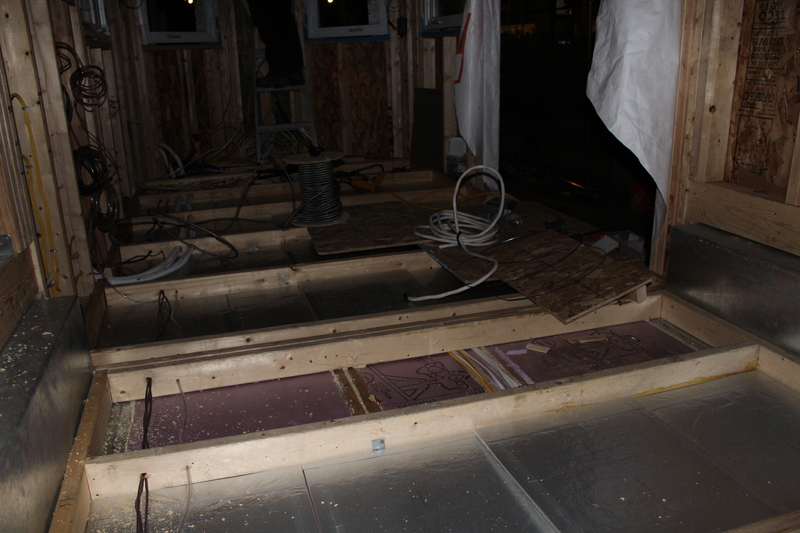 Once the bed was insulated and able to withstand load requirements, the main floor was framed overtop of this base with 2x4s. The walls were constructed flat using 2x4s before being raised into place. They were then levelled and secured. 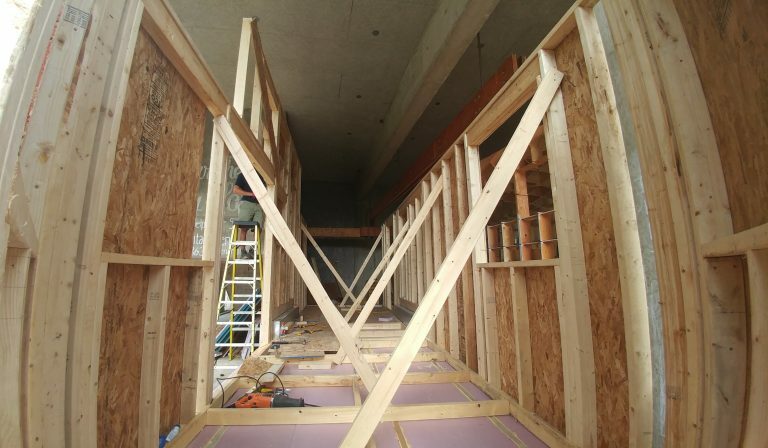 Temporary bracing was installed to keep the walls level and in position until the rafters could be raised. 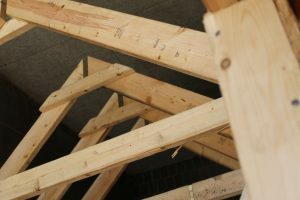 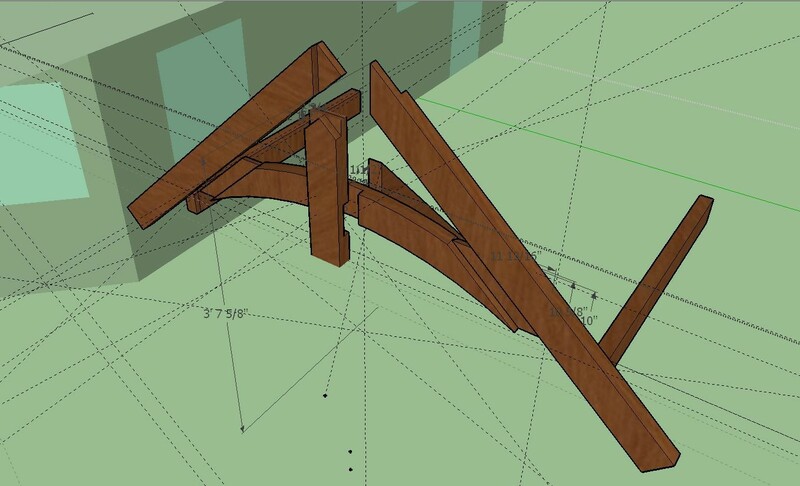 Typical wood frame construction practices were followed. 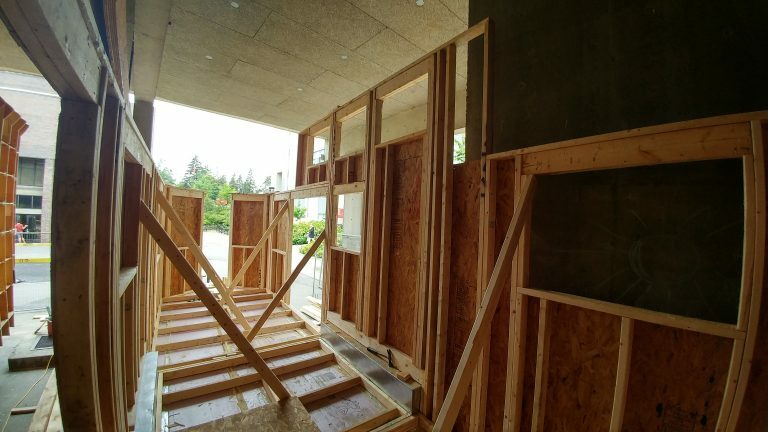 In place of plywood, which was in short supply nationally, the wooden studs were sheathed with OSB panels. 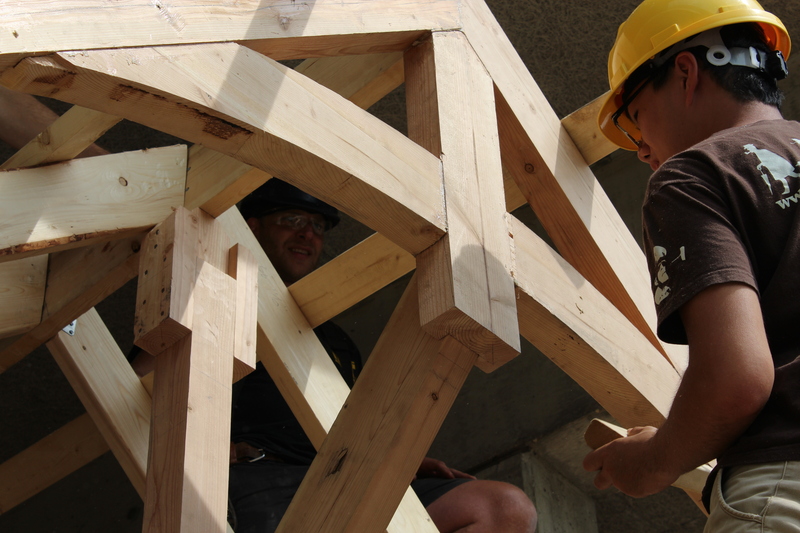 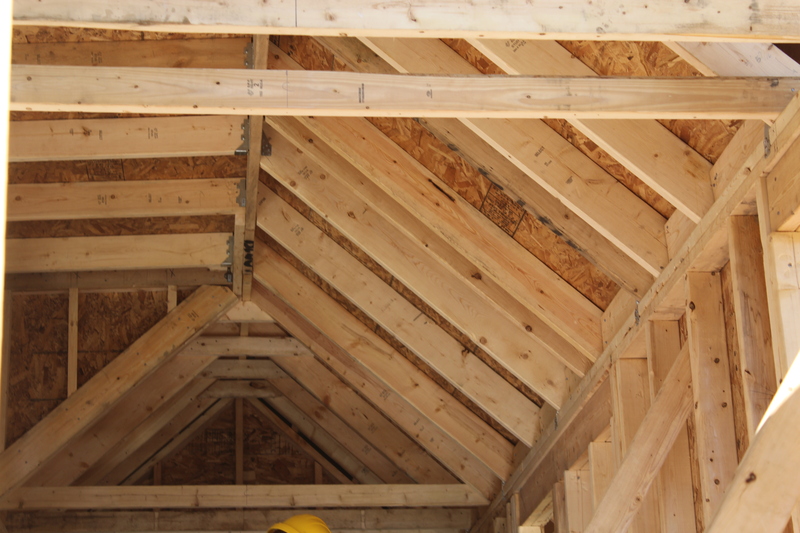 The rafters, too, were constructed on a flat surface before being raised into place. 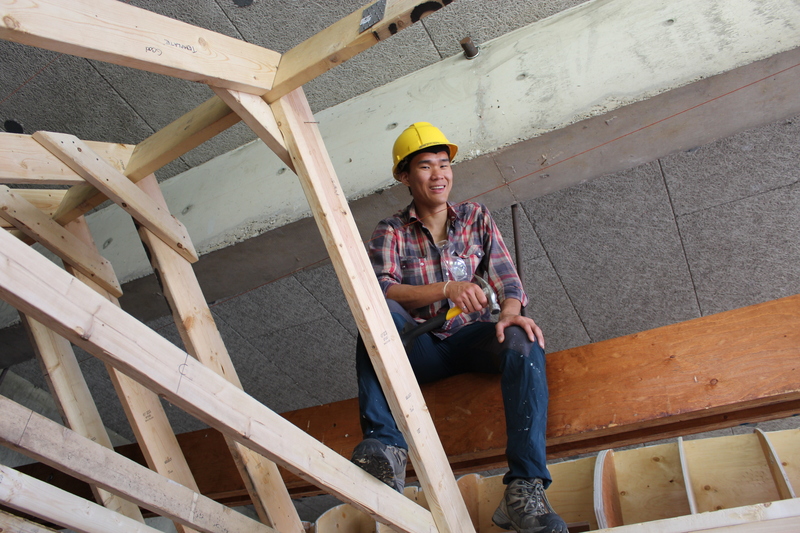 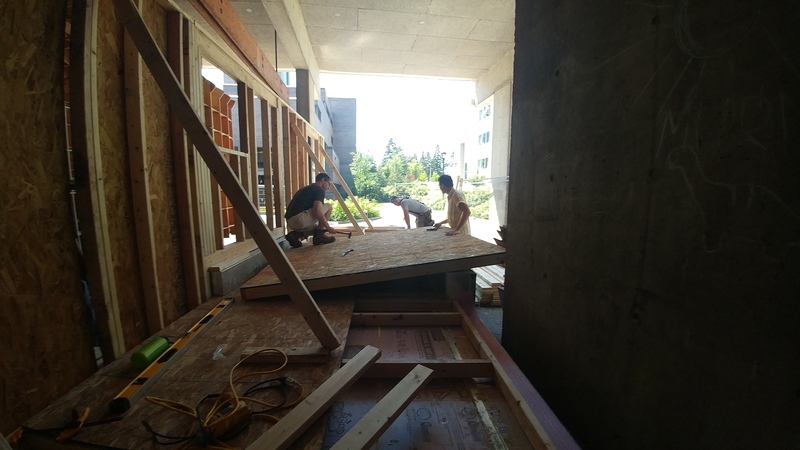 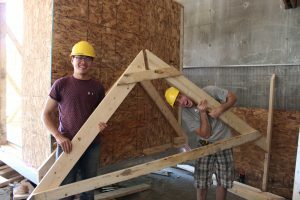 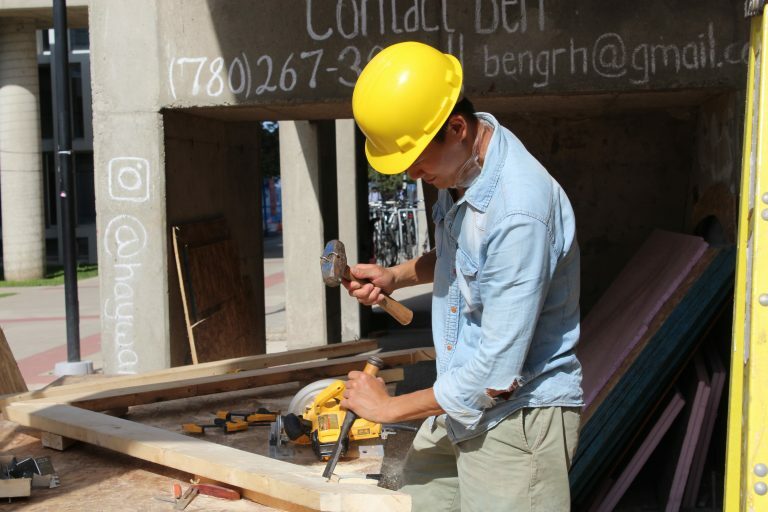 The rafters were precisely measured and cut to achieve the 42 degree slope that optimizes the interior head space while still conforming to highway limitations. The dormer rafters were cut at 3 degrees. 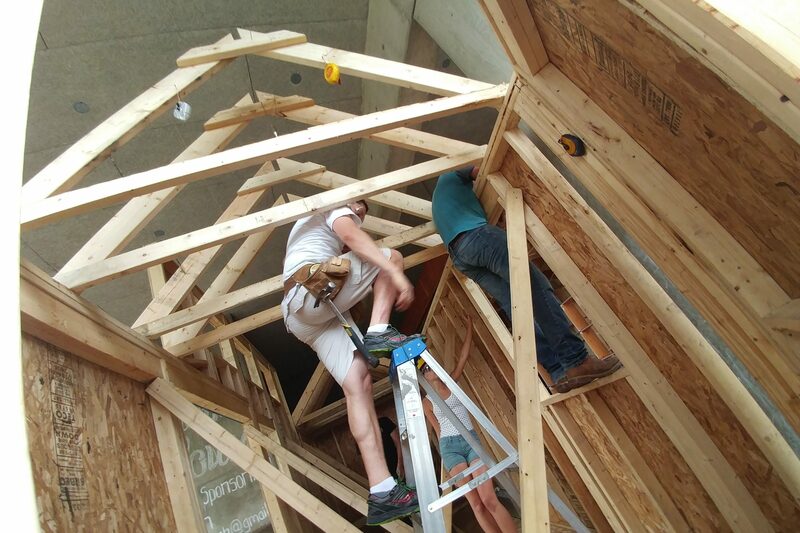 All of the rafters were raised and set into place. Finally, the long ridge beam was dropped into place to secure everything. 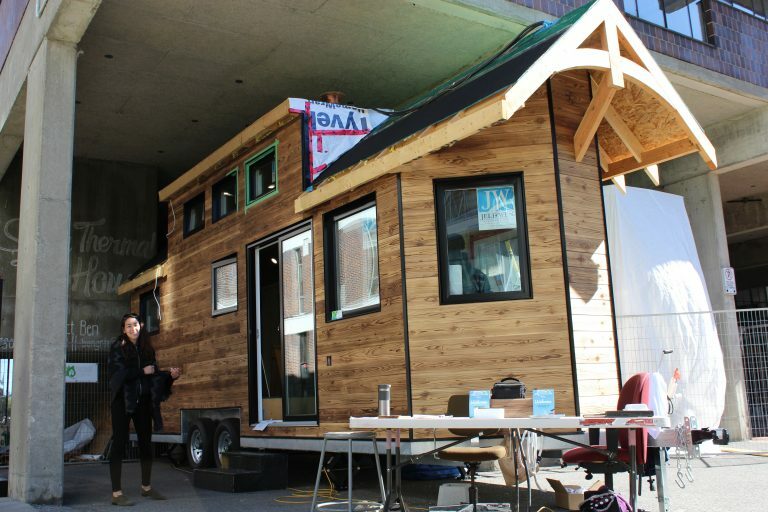 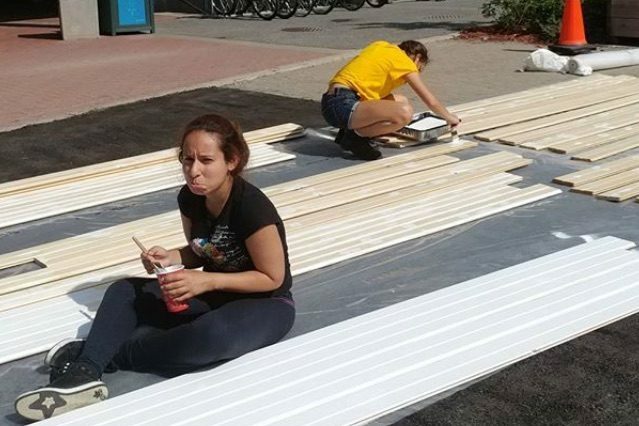 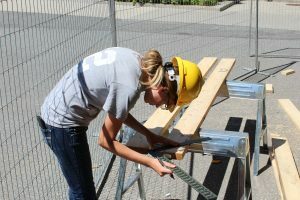 A design choice was made to extend a section of the roof over the hitch in order to maximize the number of solar panels that could fit on the roof surface. 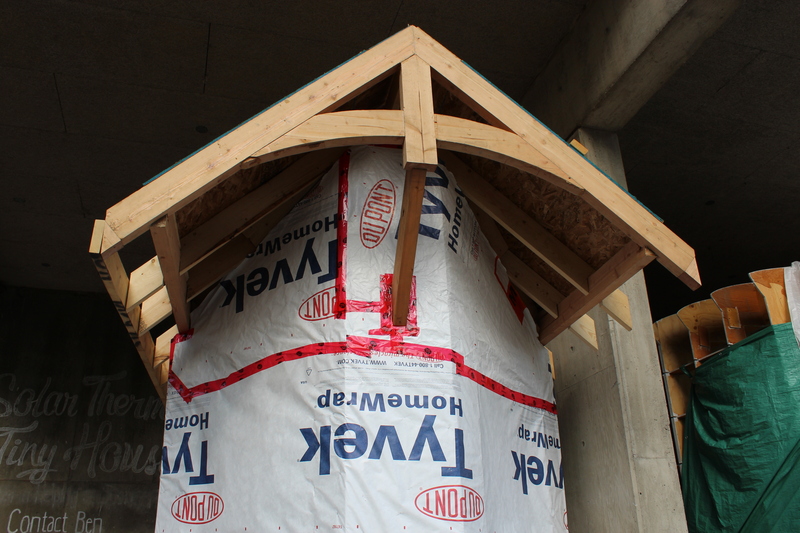 However, this made this cantilevered part of the roof subject to structural instability. 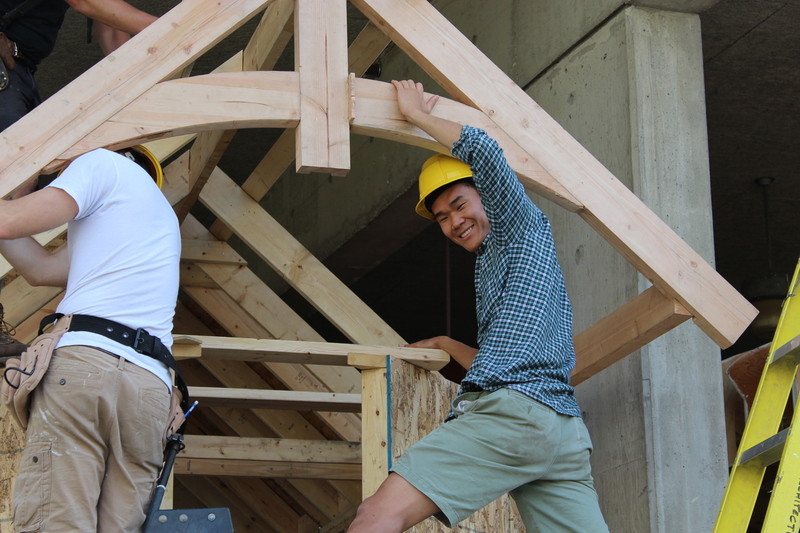 To fix this issue, a decorate arch was designed and built by Seungyeon. 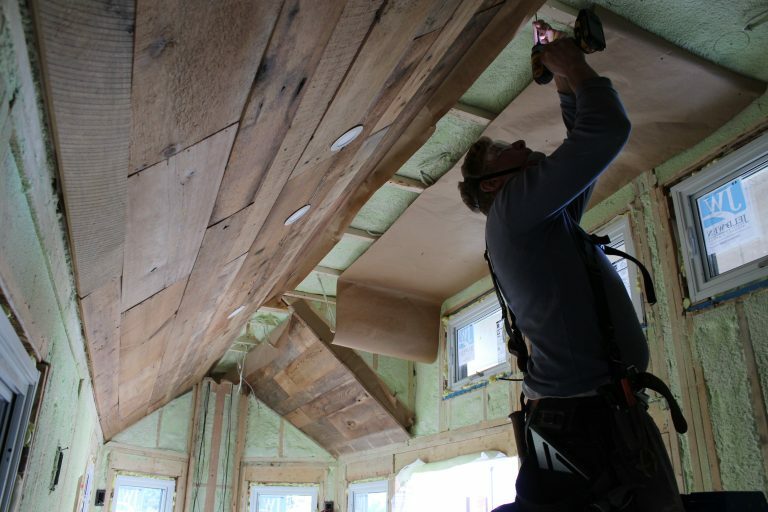 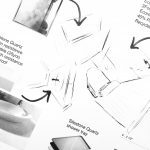 It further adds to the care and craftsmanship embodied by the home. 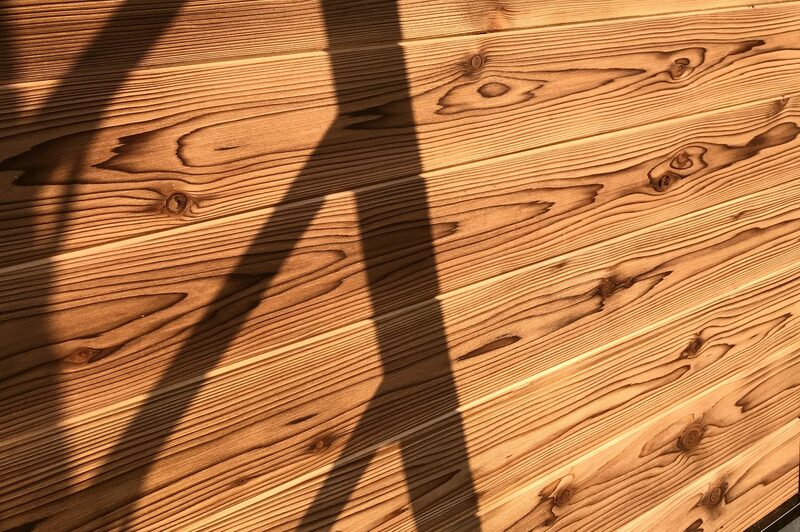 The beautiful wood was supplied by The WoodSource. 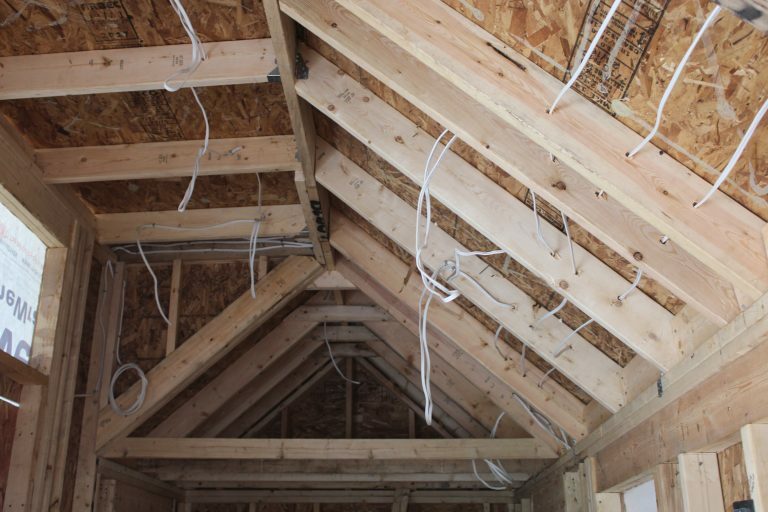 This graphic reflects real-life construction -- the placement of every rafter and stud accurately mirrors the actual framing of the home. 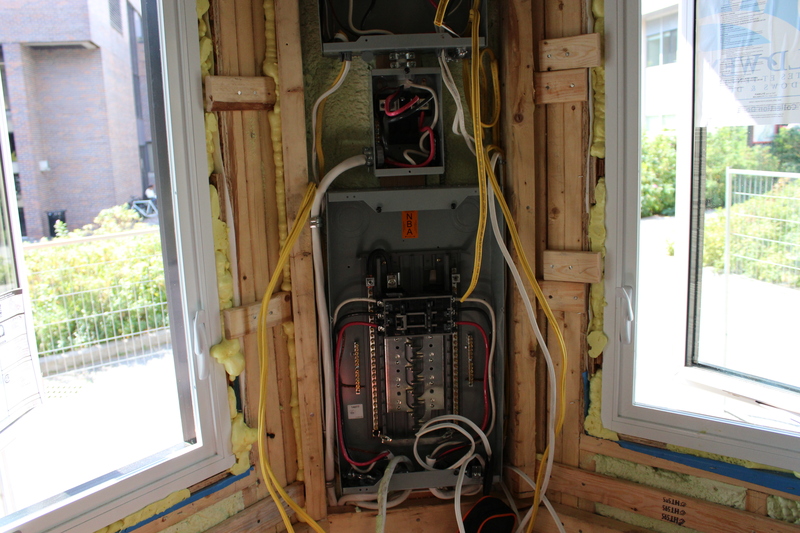 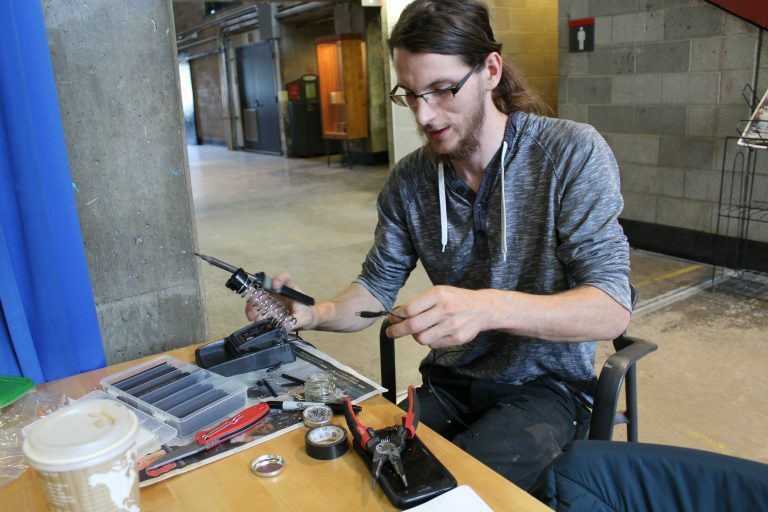 Josh, our certified electrician, took care of all of the intricate and extensive wiring. 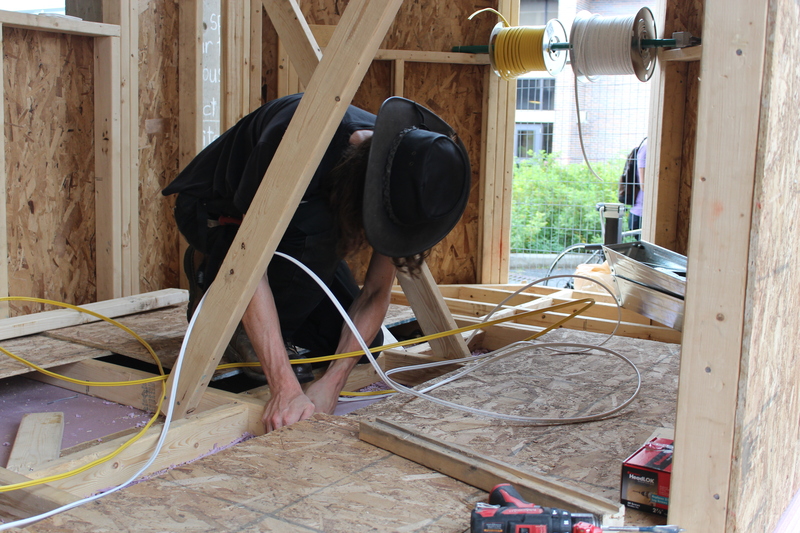 Working long days and late nights, he made sure everything was expertly wired, from the lighting to the batteries. 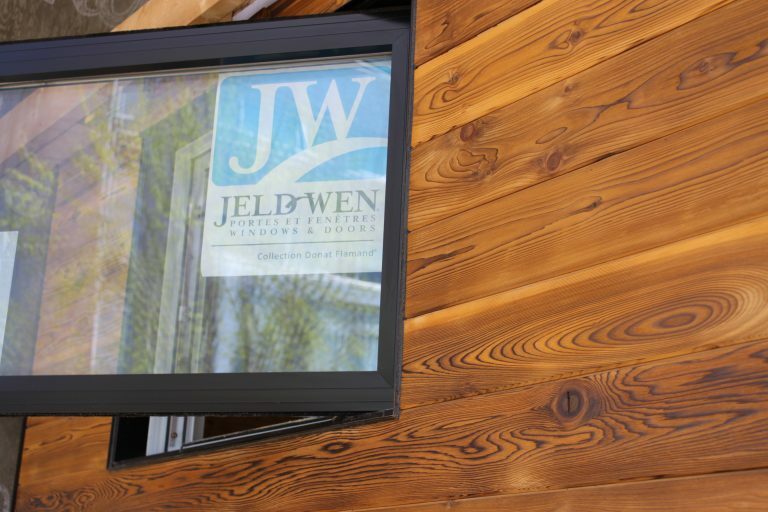 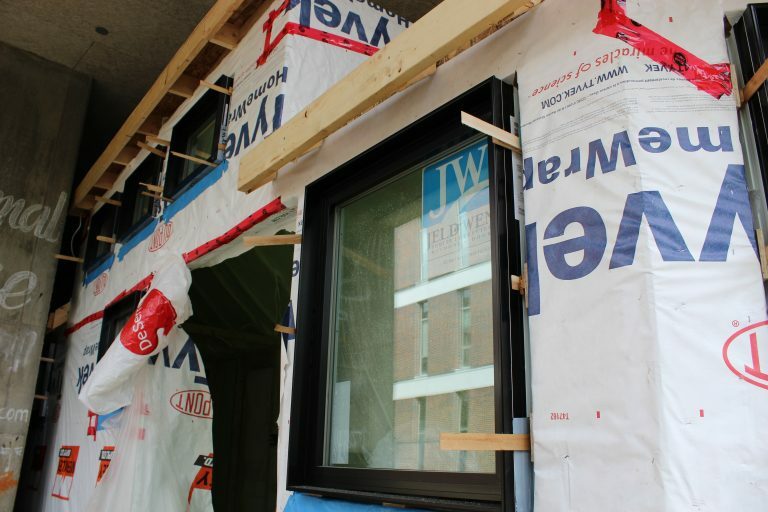 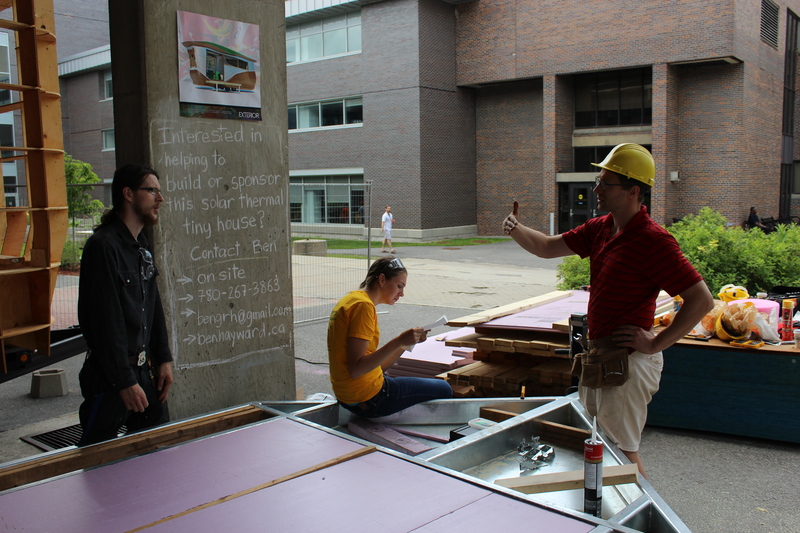 All of our windows and doors were generously donated to us by Jeld-Wen Windows and Doors. 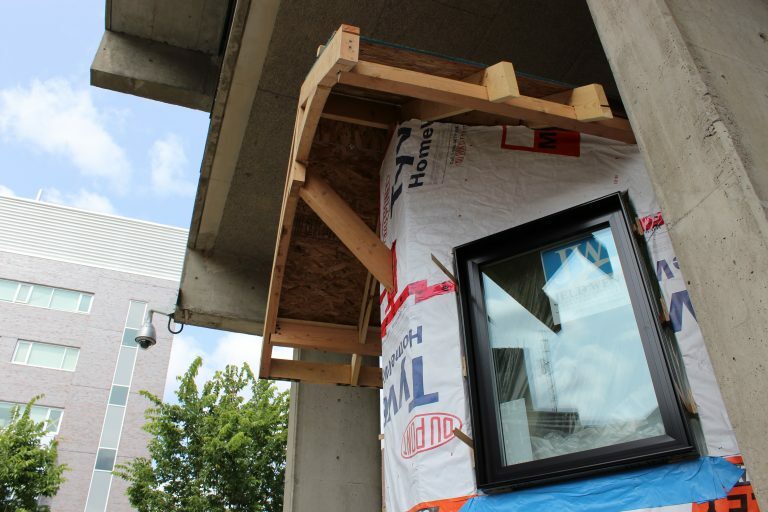 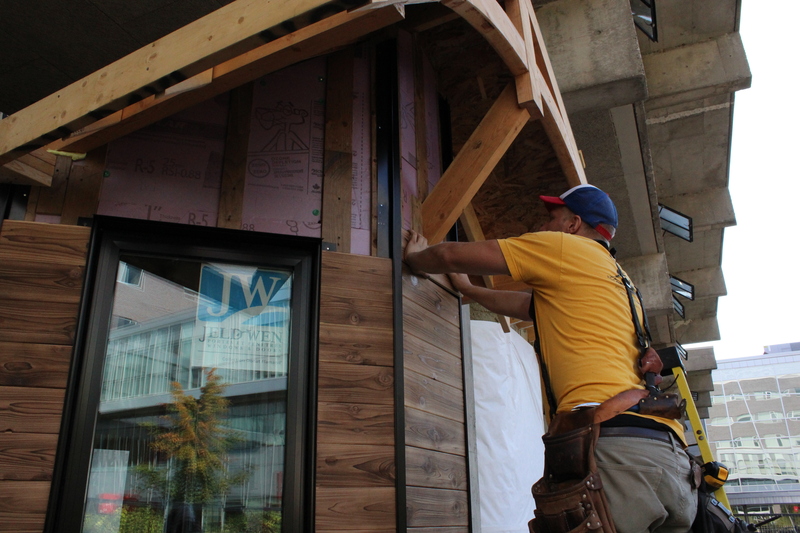 The triple-glaze hybrid windows are thermally broken and argon filled, aluminum-clad and a constructed of vinyl/wood. 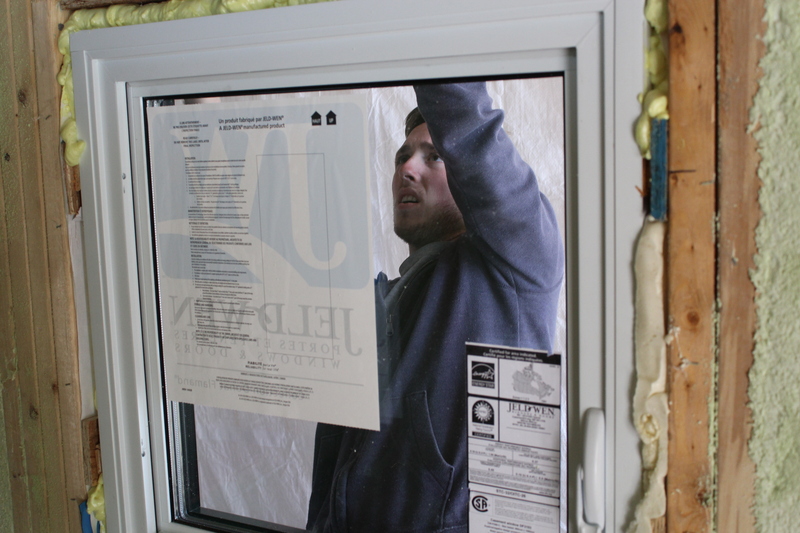 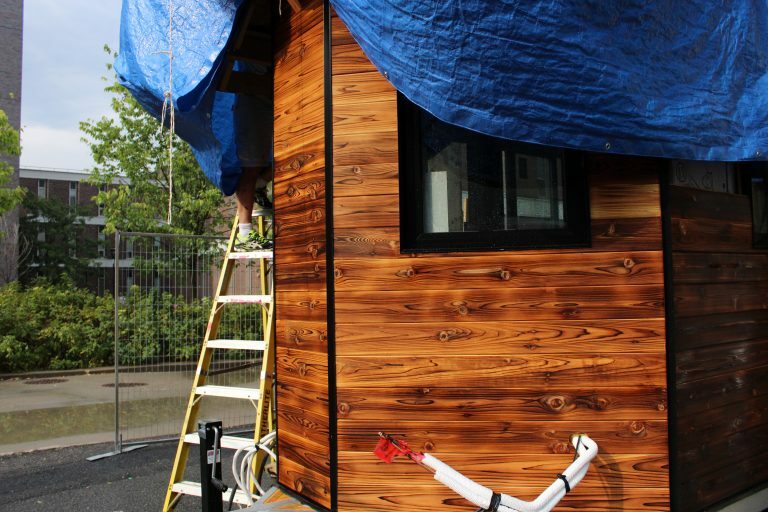 The openings were first prepared with Blueskin before the windows were installed and shimmed into place. 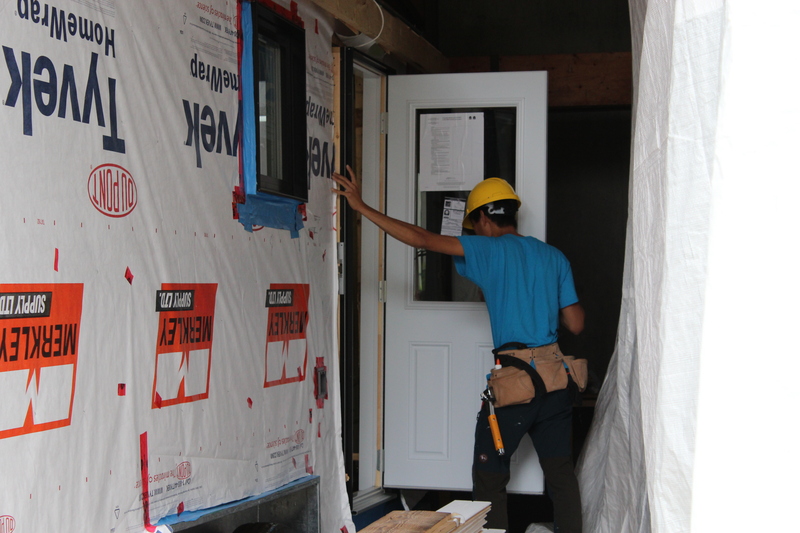 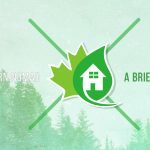 The high-performing windows and doors help the house to achieve its net-zero goals. 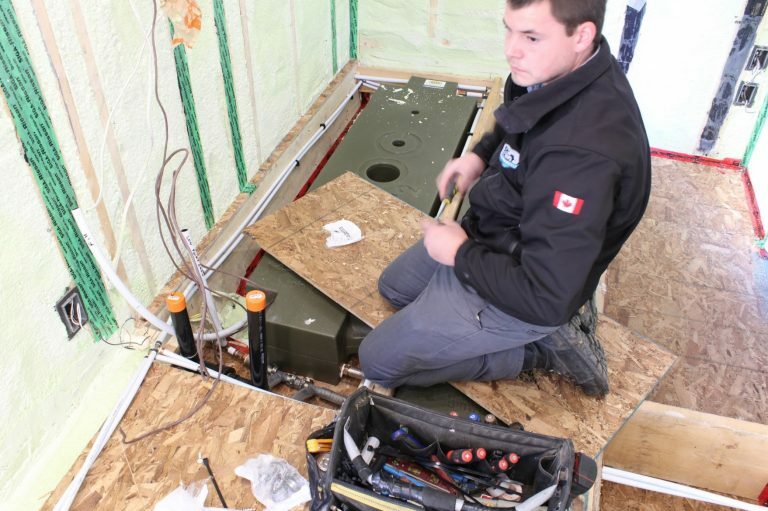 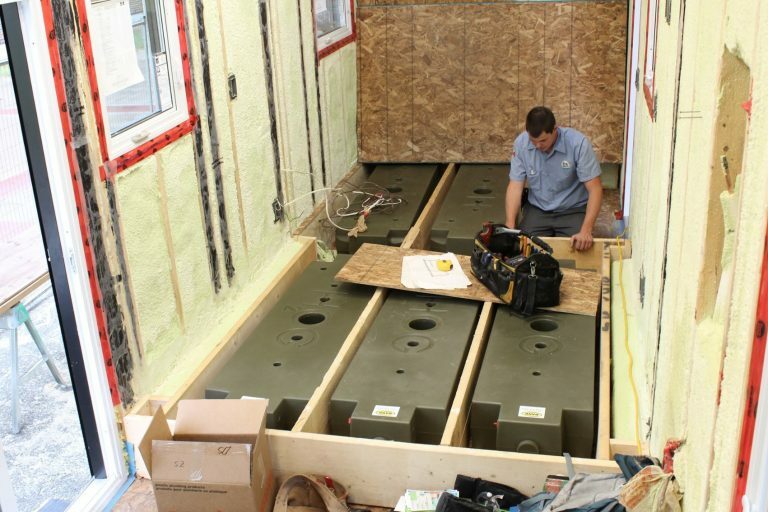 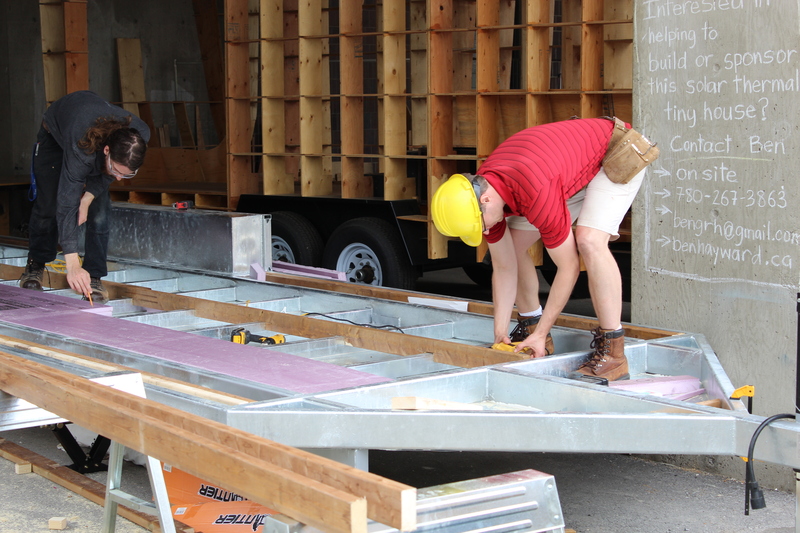 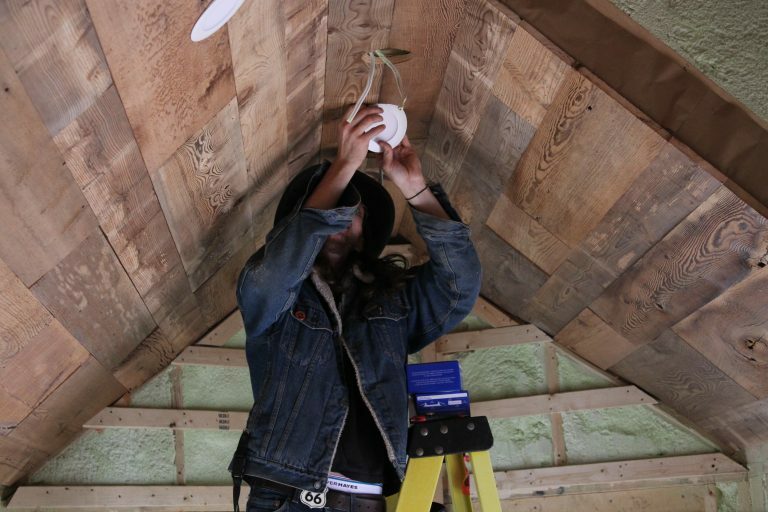 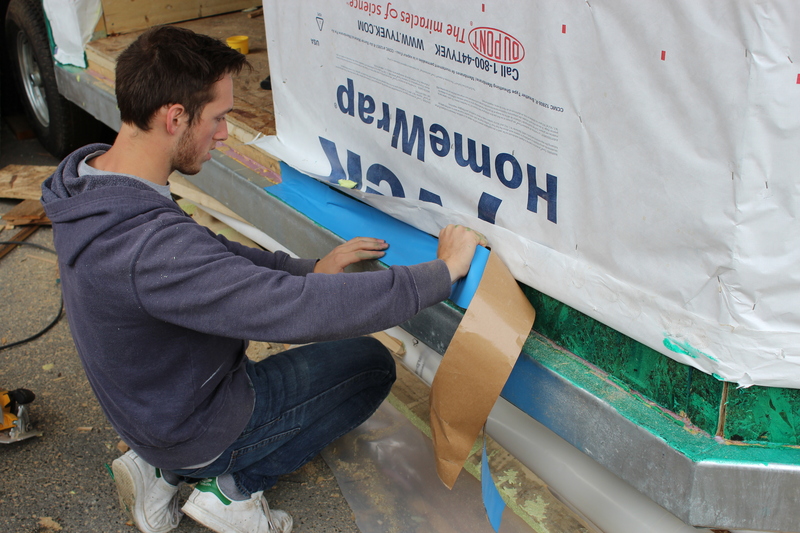 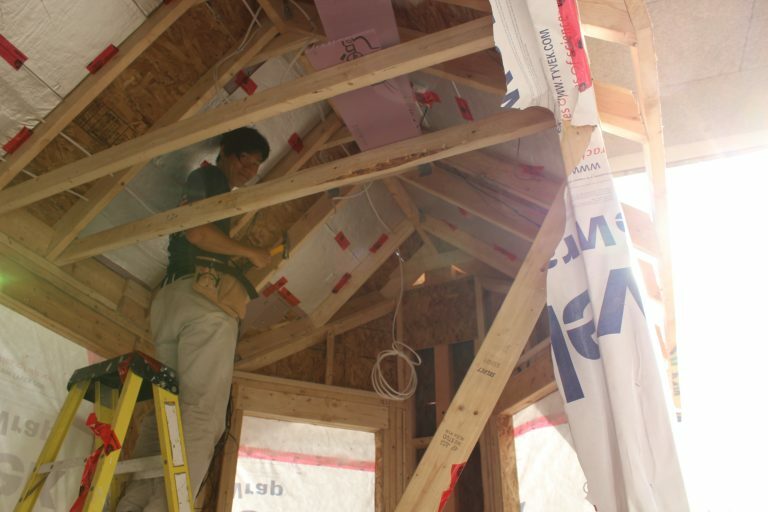 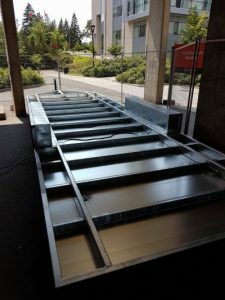 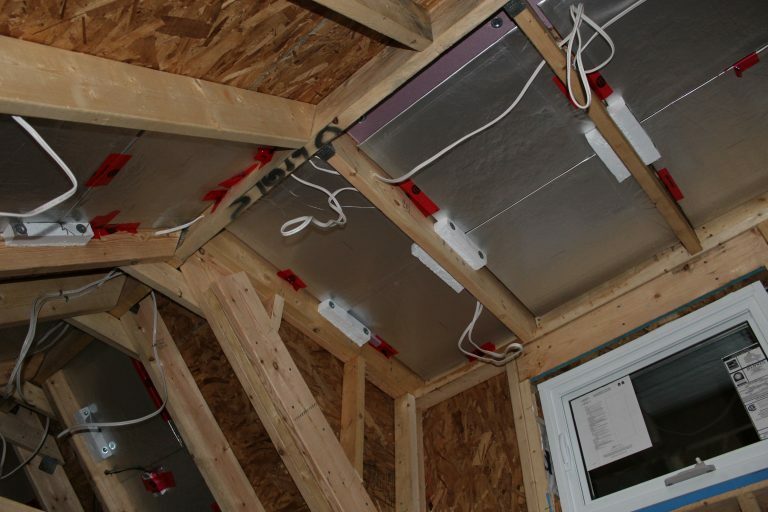 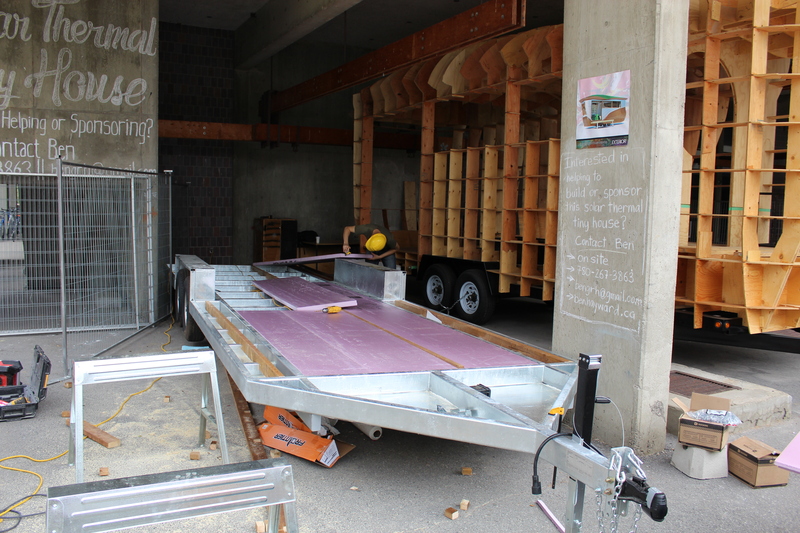 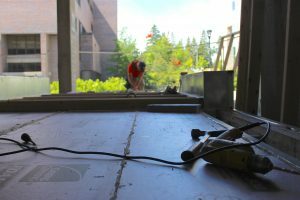 Vacuum insulated panels (VIPs) are one of the research aspects of the project; they were installed in the roof, floor, and parts of the walls to measure their performance in a residential building envelope. 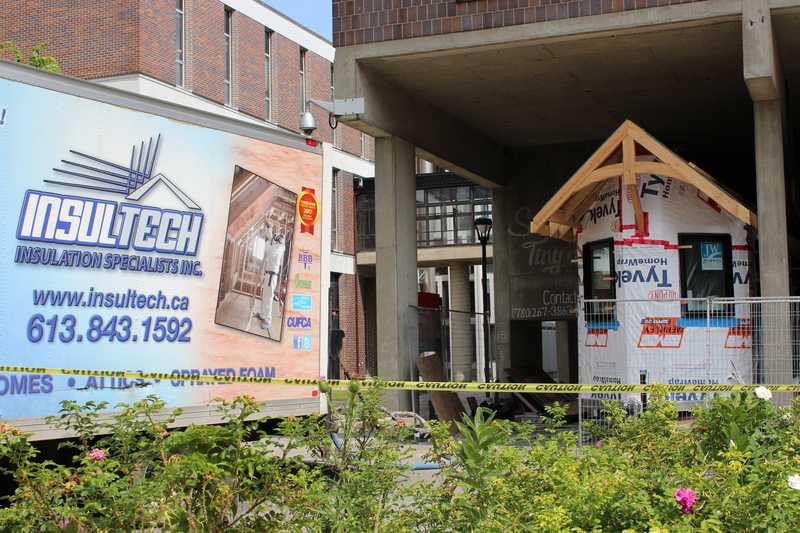 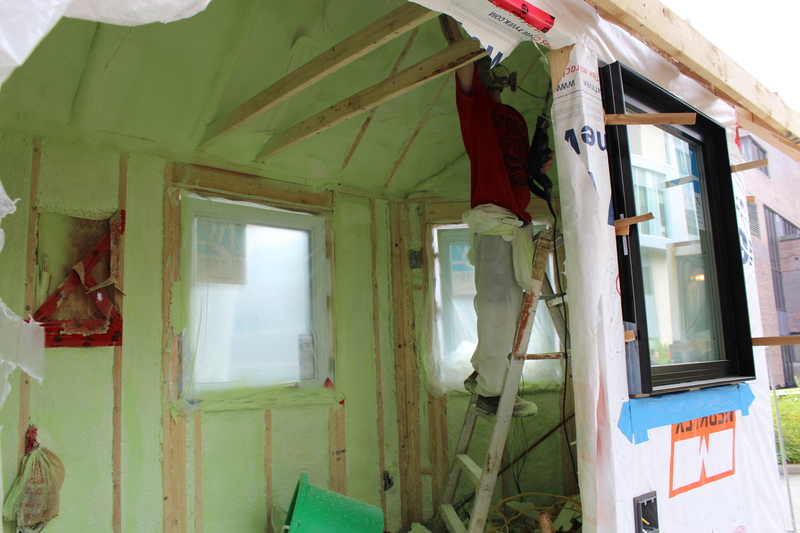 The home was then spray foamed with polyurethane insulation, courtesy of Insultech Insulation Specialists. 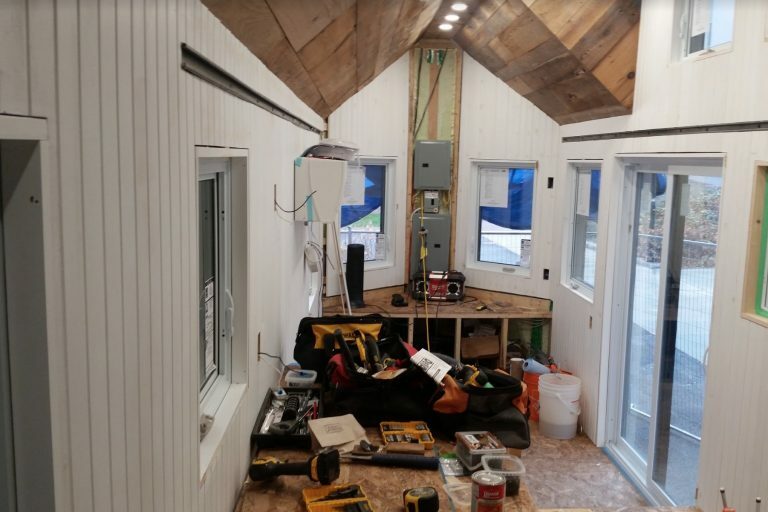 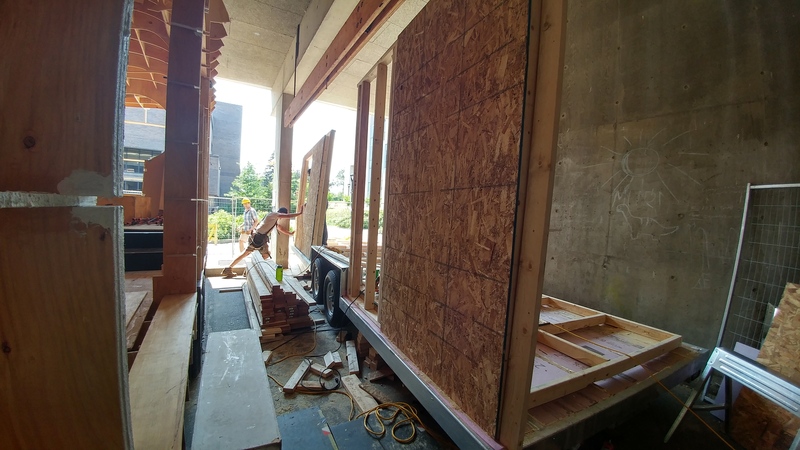 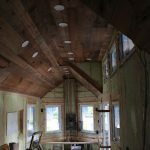 The high performance of the spray foam and VIPs allowed our walls to achieve an R-value of R37, which is unheard of in such a low-profile 2x4 wall. 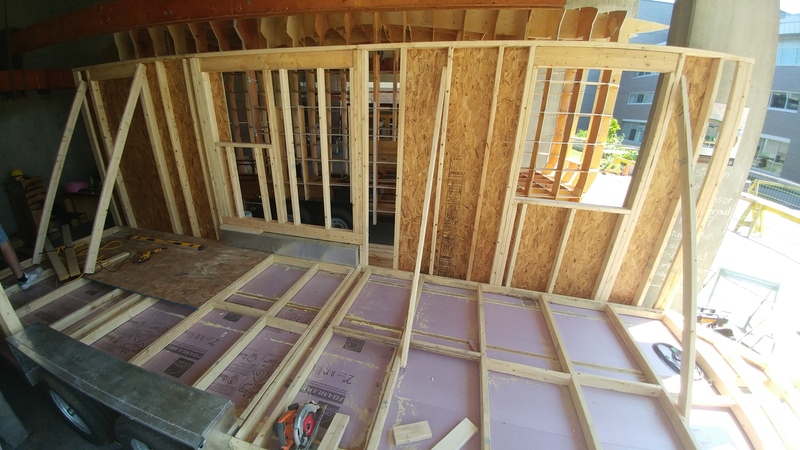 As the envelope was becoming air tight, work could begin to progress on the interior. 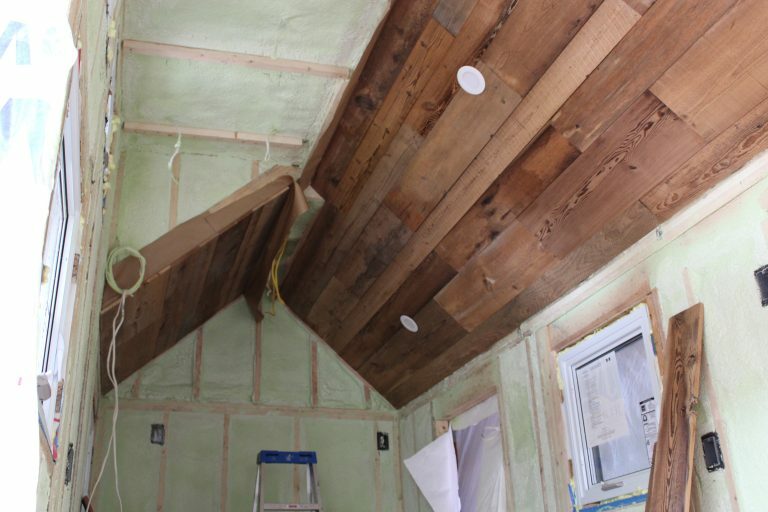 The ceiling is composed of reclaimed barn board planks, while the walls are clad with tongue-and-groove pine that was painted white. 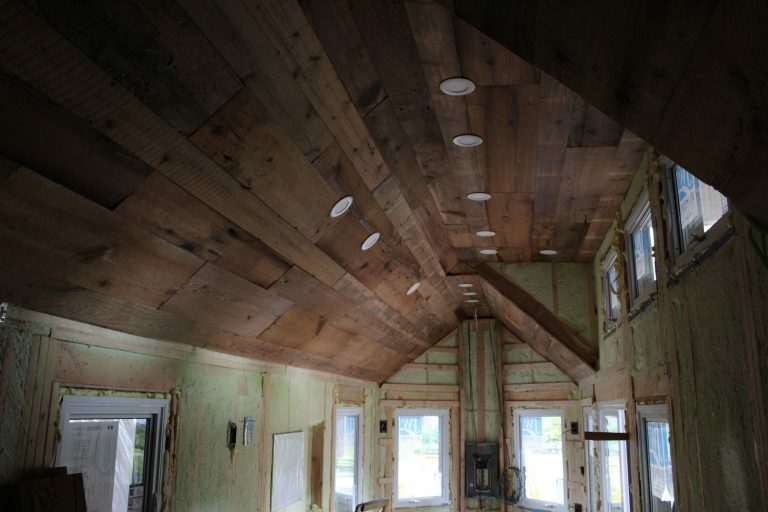 The The WoodSource and Atmosphère & Bois supplied these amazing wood products. 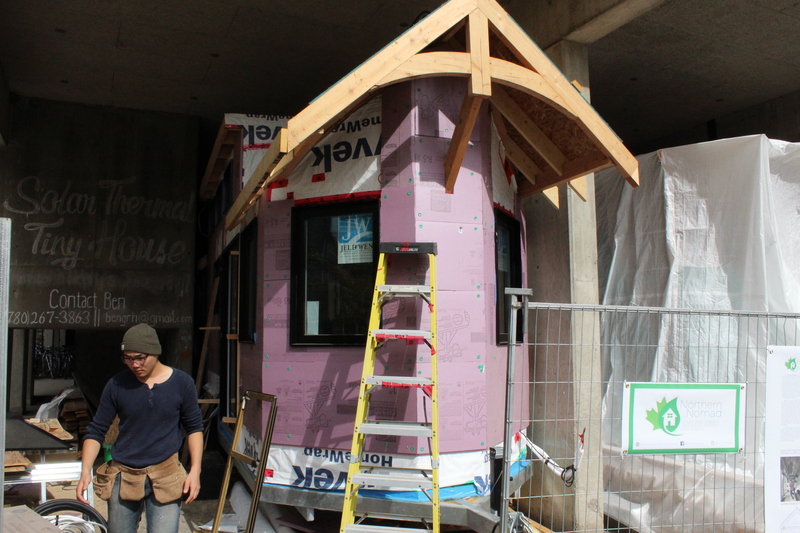 Rigid extruded polystyrene insulation was installed on the exterior face of the house before the exterior finish was applied. The selected finish was charred cedar, a skill that Connor may have only learned at the start of the summer but had mastered by the end of the summer. 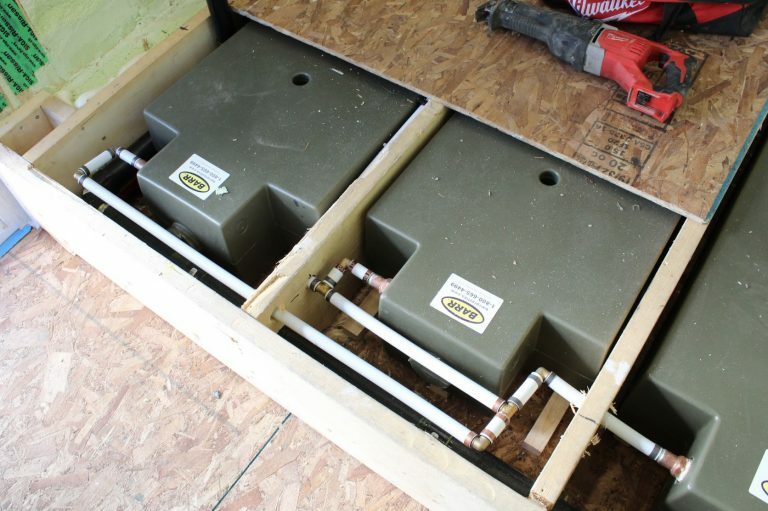 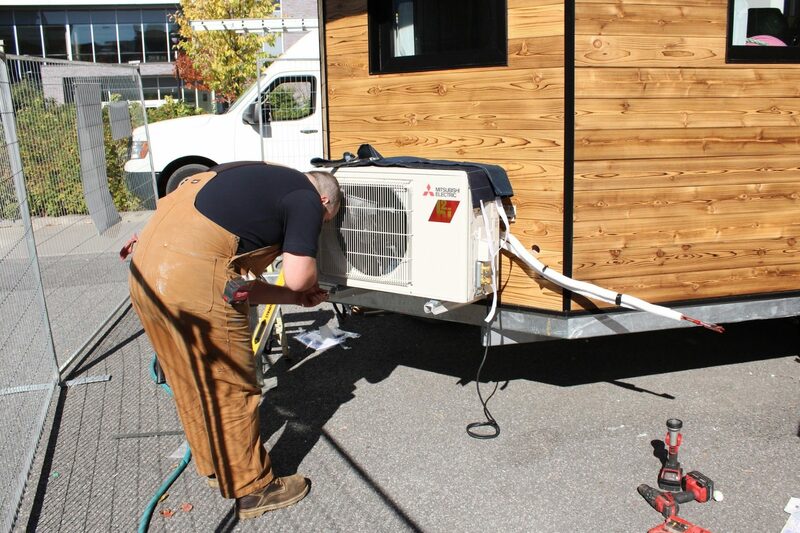 ClimateWorks and DS Plumbing helped us instal our heat pump and rainwater tanks, respectively. Progression would have been difficult without professional and timely service from both establishments. 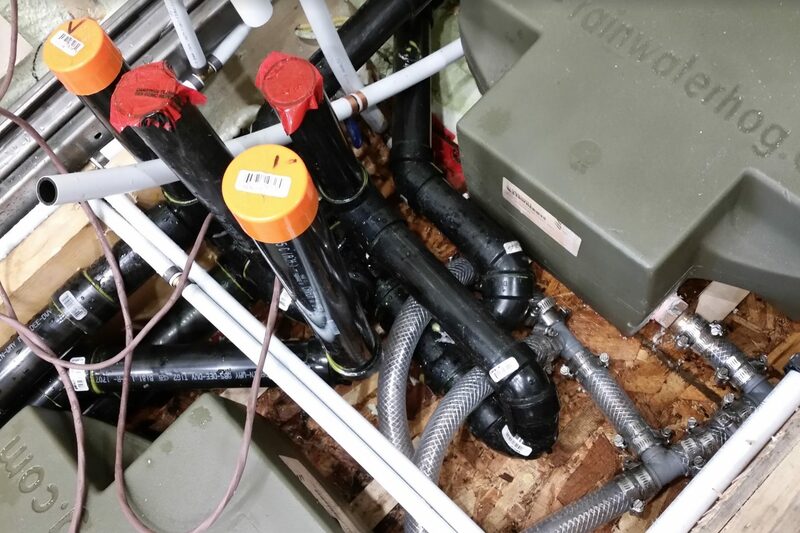 Our five rainwater tanks were plumbed and then hidden under a raised floor, a practical and design choice to create interest by varying the floor level.